Chris Ford, Fund Manager at Smith & Williamson, discusses the Smith & Williamson Artificial Intelligence Fund and the broader investment opportunities presented by artificial intelligence. He also outlines how the Fund compares to others that employ a global thematic investment approach. PRESENTER: Well today I’m joined by Chris Ford, who’s the Fund Manager for Smith & Williamson’s Artificial Intelligence Fund. Well, Chris, it’s good to have you with us today. So let’s start by looking at what exactly is artificial intelligence and why would you invest in an AI fund at this time? CHRIS FORD: So artificial intelligence can be thought of as the ability to automate the process of converting data into useful knowledge. It sits at the nexus of a number of enabling technologies. All of them rapidly evolving that sit behind the artificial intelligence and enable it to be applied in a number of different ways within the global economy. The breadth of the application of artificial intelligence within the global economy at the moment is growing, and it’s already extraordinarily broad. People are engaging with artificial intelligence systems today, in many cases without even knowing that they’re there. So we believe that we’re at the inflection point in respect of the adoption of artificial intelligence systems within the economy, and the implementation of these systems within the economy will have a meaningful and substantial impact on the way in which we live our lives, but also the way in which we think about growth rate within the global economy and where that growth is to be found. So we think the importance of an artificial intelligence fund is that we have the opportunity to provide the clients pure revenue exposure to what we believe to be one of if not the fastest growing element within the global economy. PRESENTER: Well what makes this fund different to other technology or robotic funds? CHRIS FORD: So technology funds and robotic funds are very different from what it is we’re looking to provide. So a traditional technology fund for example will be somewhat high bound within the sector that it is designed to address. The very nature of the broad application of artificially intelligent systems leaves us with a huge smorgasbord of opportunity right across the economy, much of which will be out the purview of a traditional technology fund. So there are opportunities to be found in the consumer discretionary sector, in the consumer services space, within healthcare, within industrials, within energy, within financial services in particular. Many of which will be un-investible for a traditional tech fund or at least in only limited scale investible. Robotics is an interesting expression of artificial intelligence. You can think of a robot as an embodiment of an artificial intelligence if you like. So AI is the enabling technology that sits behind the robotics that a robotics fund would look to invest in. But of course robotics is only one slim vertical of the broader opportunity to apply in artificially intelligent systems across the economy. Other examples might be cyber security or automated driving or automated triage for the healthcare services space for example. Many of these sit outside of the traditional purview of a robotics fund. For a robotics fund the bread and butter tends to be traditional robotic, industrial robotics companies, such as those that one would typically find in Japan and in Germany. The result of which is that a robotics fund can provide very targeted exposure to one of the more economically cyclical spaces enabled by artificially intelligence, but in no way does it capture the full breadth of the opportunity that the artificially intelligent economy is going to provide. PRESENTER: So what sort of companies are likely to make up your portfolio? And is this just really thematic stock picking? CHRIS FORD: So the type of companies that we would look to invest in will be those that can offer to us highly targeted and pure revenue exposure to artificial intelligence. We believe that artificial intelligence is going to be a persistent theme within the global economy for some time, and we believe that it’s going to be a rapidly growing theme, and we think that those growth characteristics are something that we can express within our portfolio through that targeting of pure revenue exposure to that theme. So it is at some level good old fashioned thematic stock picking, but very purely targeted to give that exposure to pure artificially intelligent revenues. And we use a number of tools to allow us to find those companies, and one of the critical differentiating factors for our portfolio here is that we have embedded an artificial intelligence within the management of the fund. So we have that competitive advantage that’s brought to bear from our bespoke artificial intelligence that we have that allows us to do a lot of the heavy lifting, looking for the markers as we define them of artificially intelligent systems across the economy. PRESENTER: Why is the fund global, and is it growth oriented? CHRIS FORD: The fund is growth oriented, and you wouldn’t be surprised by that given the growth characteristics that we think will accrue to the theme and will persist for a number of years from here. The fund is global because of the global nature of the artificially intelligent economy. The last big tech cycle at the beginning of the 2000s and the end of the 1990s was characterised by that extraordinary growth of new companies and new technologies coming largely out of the West Coast of the United States. But of course that’s anomalous when you look back over tech cycles over the course of the last 50 or 60 years. But we view technology through the prism of the experience of the former cycle. The AI cycle is much more normal in the sense that it’s characterised by great entrepreneurial endeavour across global economies in all parts of the world. So whilst Silicon Valley certain has its role to play, so does London, so does Zurich, so does Japan, so does China. The UK itself has an extraordinary heritage in artificial intelligence dating back very many decades, and largely with Turing at the end of the Second World War as a poster child for artificial intelligence research in the UK. But universities such as London and such as Cambridge, such as Edinburgh and obviously the Bristol robotics lab as well have all played a significant role in leaving the UK as one of the great AI research centres in the world. And we have an opportunity to make sure that we’re plugged into that ecosystem in the management of this fund, to better inform the investment decisions that we’re taking. So we feel that there is an opportunity to make investments across economies and across the global economy delivering to clients within the fund a truly diverse exposure, all of it targeted and offering pure revenue growth driven by artificially intelligent systems. PRESENTER: So what would you say is the value of including this type of fund in a client’s overall portfolio? CHRIS FORD: So the value of this kind of fund is the robustness of the theme that lies behind it. So the fact of the adoption rate of artificial intelligence being at a very early stage, the fact that we think that we have extremely broad applications available to us that give us a very long runway for the implementation of these technologies, leads us to feel that there is real structural growth that we can give pure exposure to here. The place for this kind of fund within a client’s portfolio would be where the client wants to have exposure to that quite extraordinary growth that we think will be offered by artificial intelligence over a number of years from here. But where that client wants to take that exposure in a diversified risk-adjusted manner where they aren’t necessarily accepting the kind of cyclical exposures or the operational gearing that might be inherent in something like a robotics fund, which is in some ways more akin to a traditional capital goods fund than it is to an artificial intelligence fund. 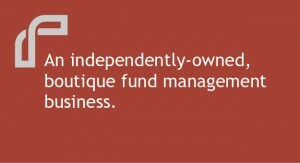 Alternatively, when compared to a traditional technology fund, this fund will give you much broad exposure across sectors, and therefore will give the benefit of that diversification without necessarily asking you to sacrifice any of the inherent growth that you might expect from a traditional technology fund. PRESENTER: And how will you avoid the problems that we saw that affected the tech sector funds in the late ‘90s? CHRIS FORD: It’s partly a result of that diversification that I referenced a moment ago. So we have within the fund that broad diversification across economic sectors, and much of the exposure, certainly some of the exposure within the fund will be in sectors that would traditionally be thought of as being somewhat defensive in characteristics, such as healthcare for example. So we’re not necessarily limited in respect of crowded trades within the information technology sector alone, but can look to find value and growth in the artificially intelligent economy no matter where we look for it. So we think we can avoid some of the pitfalls that accrued to technology funds in the early part of the 2000s as a result of that better diversification and the robustness of the theme that sits behind the investments that we’re going to be making. PRESENTER: Now, this isn’t the usual Smith & Williamson fund, so why is it being launched by you and what sort of experience do you have managing thematic funds? CHRIS FORD: So my partner Tim Day and myself joined Smith & Williamson from Pictet. Pictet is obviously the market leader in, or a market leader in the management of thematic product. We managed the global equities business for Pictet before joining Smith & Williamson, a couple of years ago, and there we innovated a couple of global funds which had that kind of thematic bent to them; most recently a global major players fund. For Smith & Williamson this is a very interesting opportunity. Smith & Williamson’s business has for 100 years been characterised by the entrepreneurial environment within which it sits, and as the entrepreneurial environment in London has become increasingly characterised by those involved within artificially intelligent systems, so our business has become more inflected by AI in our interactions with counterparties and clients and so on. We have the ability to therefore be plugged into that artificially intelligent economy here in the UK, with London as one of the key research hubs for artificial intelligence. Being based here in London and working at Smith & Williamson gives us a real edge in respect of the information flow that we’re subjected to. London has a key role to play in the adoption of artificial intelligence. DeepMind is based here and they’re owned by Google. We have Europe’s largest biotechnology research lab recently opened in the Crick Institute. We have the Turing Institute at the British Library which looks to bring together the universities of Oxford and Cambridge and London and Bristol and Edinburgh and Warwick in one place in a large research hub, not coincidentally adjacent to Google’s DeepMind campus. So the network effect that one might traditionally associate with Silicon Valley in respect of traditional technologies, are very much now beginning to accrue here in London within the artificial intelligence space. PRESENTER: Well it’s certainly one to watch. Chris, thank you so much.